About 8 years ago, when I first started creating regular content on backyard vegetable growing in raised beds (particularly the high sided ones) there wasn't much interest. However, these days there are plenty more people who have joined the raised bed "revolution" and realise this method of food gardening is the best. 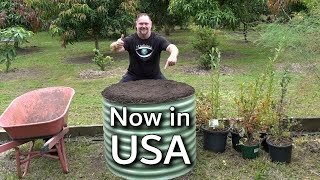 Initially, I found (to my surprise) some push back from people trying to discredit this way of gardening by stating things like the beds heat up too much, they take too much water, chemicals leach out into the soil, and they're too expensive to fill with growing medium. Of course, these claims are all complete myths and I have even written a whole article here that debunks a good 10 of them. 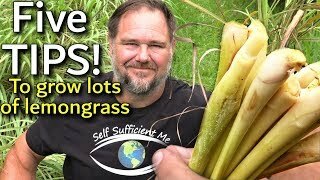 Regardless, the naysayers have mostly tapered off with more and more backyard veggie growers either building or buying their own raised beds, although, I do still get the odd trolling comment on my YouTube videos. 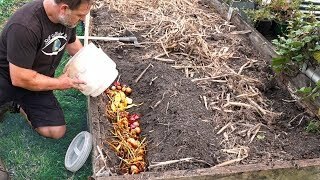 For me, raised bed gardening has been a life changer and I touched on this in one of my recent videos (see the end of this post if your interested) but honestly, I could never go back to growing our vegetables in a standard in-ground plot. There are a number of reasons why raised bed gardening is the way to go for me and yes the obvious one is physical. Those who have followed my content for a number of years would know that I have several pieces missing off me due to a serious parachuting accident that happened when I was serving in the Army. Technically, I have a permanent disability with a significant percentage on the scale of things, however, most people wouldn't know that by just looking at me or even seeing me move around. I have never wanted to lean on that "disability" fact and instead I prefer to, well, just power on... without elaborating too much because it's not necessary for this post. Yes, gardening in raised beds is easier if you have a disability, permanent injury, or are just getting old and creaky but I really love it more because it's convenient. In other words, even if by some miracle all my ailments were suddenly cured I would still prefer to garden in raised beds! To me, it's like saying would you prefer to cut up that fallen tree with a hand saw or a chain saw. I mean both will do the job but we all know which one is faster and easier. Furthermore, both still are physical to an extent and thus beneficial (health/exercise wise) so what's the point in cruelling oneself if there's a better way? I find it so therapeutic to walk around and in-between our raised bed garden leaning into but not bending over to pull weeds or harvest produce. If I did have to bend over constantly and get down on my knees to work in the patch I'm not sure that my heart would be as invested in gardening nor my motivation to get outside and do the maintenance required. 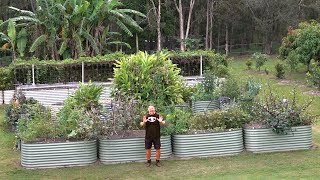 The first colorbond raised garden bed I purchased in 2006 was from Birdies Garden Products online - actually, we got three of them... At the same time, I built 3 x 2.4m square raised beds made from 75 mil thick timber sleepers. Today, the Birdies raised beds are still going strong apart from a few dents but the sleeper beds are rotten and falling apart. I think it's time for us to replace them with high sided raised beds from Birdies. 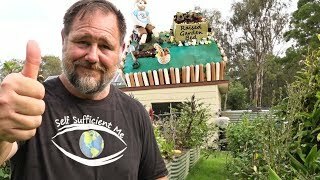 Late last year I built our own corrugated raised beds from scratch and I was really happy with the end result! Nevertheless, it did take a lot of time and energy to do and although it was a cheaper option to build them myself, it's still much easier and faster to assemble the pre-stamped colorbond beds. So that's what I will be doing - at some point this year. Anyway, it's great to see and hear how I'm not the only one who's into high sided raised bed food gardening. Quite the opposite, from what I'm gathering the raised bed food gardening revolution is already here! 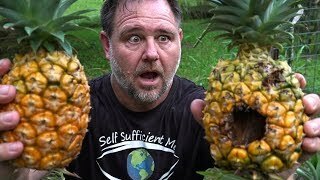 Here's the video on "Stand up gardening"
I'm down, I can't wait to start! Love from Houston, Texas!